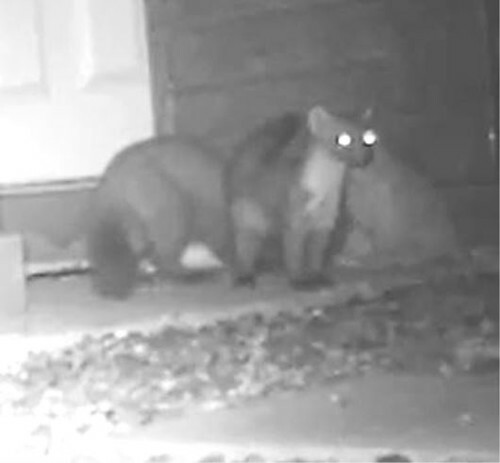 The two young Pine Martens that come every night to be fed have now been named and studied to note different marking and behaviour - One is called we call Bolshy, who has a rather long tail, and can be a rather naughty boy! I have a bowl full of pebbles and shells on the deck, which he likes taking them all out, digging up the strawberry plants and shewing on the outside door mat, taking slide rides down the bonnet of the car, (luckily no scratches yet). We never named the parents, they usually come about 4:00 am, never to the deck or veranda, keeping to the back area to where I put food under a large fern. Slide-rides down the bonnet of the car... now that's a must-see! We've got out of the habit of putting out our trailcam since the fox cubs usually come before dark, (and all I was getting were clips of a VERY overweight tabby cat spraying my compost bin. I am looking forward to seeing more of Bolshy and Lopey. Lovely shots Helen, nice to know they are around, are you taking single shots or video? These are clips from video. I was going to download to Flickr But having had no end of problems re Internet etc., Flickr, though downloading photos, keeps timing out on videos, despite me editing them and making them shorter. 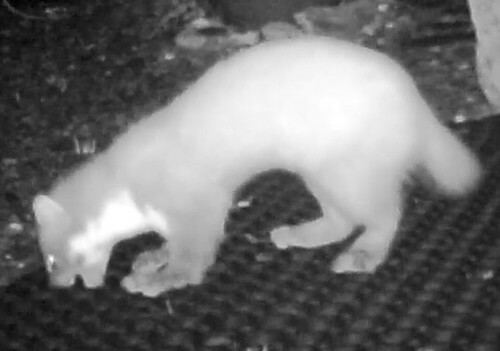 If I eventually get it sorted I will upload the Pine Martens playing and shewing the mat.